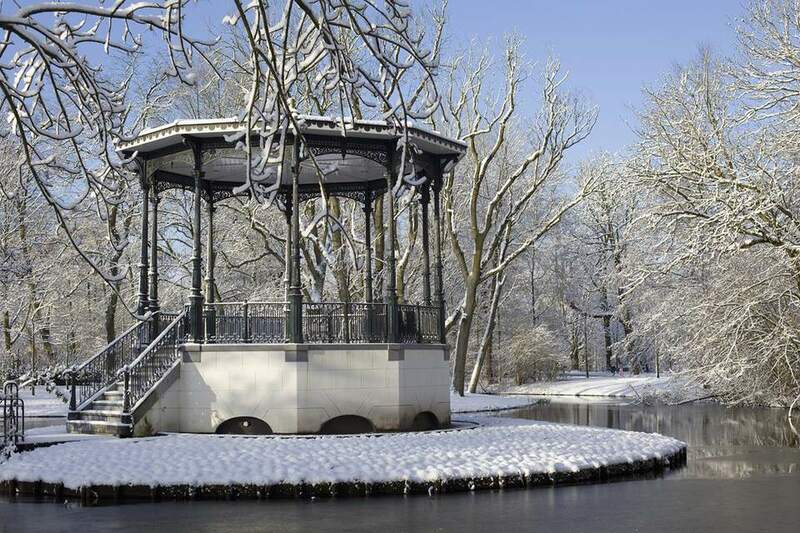 While its spring tulip season brings the most tourists to the area, Amsterdam has many hidden and not-so-hidden attractions in the winter for those willing to brave the colder weather. The weeks leading up to the December holidays in Amsterdam are popular with tourists, and hotels rates and airfares will be closer to those found in the late spring and summer high seasons. But in January and February, the tourist numbers dwindle significantly, so those looking to save money in their travel budget should be able to find good deals. Winter days in Amsterdam are similar to those in the northeastern United States, with the sun setting as early as 4:30 p.m. in mid-December. The weather is a deterrent for many tourists; December is Amsterdam's rainiest month, and February its coldest. Here’s what to expect if you’re planning a trip to Amsterdam in the winter months. Holiday season traditions are well underway in Amsterdam by early December, as the Dutch celebrate Sinterklaasavond (St. Nicholas’ Eve) on December 5. To prepare for the arrival of Sinterklaas (St. Nicholas), Dutch children set their shoes next to the fireplace at bedtime, as tradition calls for Sinterklaas to leave treats in the shoes of well-behaved children. Some favorite treats include chocolates and a variety of spiced cookies, from speculaas bricks to bite-sized pepernoten and kruidnoten. Sinterklaasavond is traditionally a children’s holiday in the Netherlands. After Sinterklassavond winds down, there’s still Kerst (Christmas) to look forward to on December 25, when many Dutch (but not all) exchange Christmas gifts. The Dutch celebrate with Christmas trees and light displays, and large family meals. Then there’s Tweede Kerstdag (Second Day of Christmas), celebrated on December 26. The Dutch take this national holiday to visit relatives or to shop, especially for furniture. December 31 is "Oud en Nieuw" (Old and New), which is how the Dutch refer to New Year's Eve. Amsterdammers celebrate the incoming year with parties across the city, from comedy shows to music-driven dance parties. The last days of December are also the only time of year when fireworks sales are permitted in Amsterdam, and fireworks displays across the city help to usher in the new year. As in most countries worldwide, January 1 is a national holiday in the Netherlands as well as a day to recuperate from the hijinks of New Year's Eve. Note that many tourist attractions and other businesses are closed for the day, so check with individual attractions for holiday closures or reduced hours. Given the cold weather, there are a surprising number of annual events held in Amsterdam in January, including one of two celebrations of Amsterdam International Fashion Week. This is the top event on the capital's fashion calendar, and its "off-schedule" events ensure plenty to see and do even beyond the catwalks. Fashion week is held at the end of July and the end of January and has a lot of small events and shows as part of the main event. Not all of the fashion week events are open to the public, so check the website for the latest information and ticket prices. Another popular annual event in January is the International Improvisational Theater Festival, also known as Impro Amsterdam. Started in 1995, Impro Amsterdam attracts comedy improv performers from all over the world, who participate in shows, workshops, and talks. It’s traditionally held during the last week of January. Amsterdam also hosts an annual equestrian tournament in January, called Jumping Amsterdam. Top athletes in a number of horse sports compete in various dressage categories. Jumping Amsterdam also features children’s shows, musical entertainment, and food and drink. Valentine’s Day isn’t a native Dutch holiday, and although Amsterdammers observe some of its traditions, it’s not as widely celebrated as it is in the United States. Couples may celebrate with a romantic dinner at one of the city’s restaurants, or exchange small gifts. If you’re staying in Amsterdam and looking for a day trip, Delft is an hour away by train and features the annual De Koninck Blues Festival every February. Blues musicians take over more than 30 venues in Delft's Old Town for a few days of free performances. Some of the lectures and workshops charge modest ticket fees. Another must-see attraction is the annual Ice Sculpture Festival in Roermond (about a two-hour train ride from Amsterdam. Every year some 50 artists craft a collection of sculptures from ice and snow, which are kept cool in a thermal tent. You’ll definitely want to dress warmly: the temperature in that exhibition space is kept at 17 degrees below zero. In addition to the annual festivals, visitors to Amsterdam in the winter can check out some of the city's historic architecture, its notorious Red Light District, and its various museums. No matter the weather or the time of year, travelers to Amsterdam should have no trouble keeping busy in this culturally dynamic and picturesque city. Where Is the Tourist Office in Amsterdam?